No time tonight for chit chat. Tuesdays are my Seriously Busy Days (I love random capitalization, it's so Emily Dickinson), with school run in the morning, mother & toddler group, nursery run, school run, tap dancing, Gaelic class and Craft Night. Fit in fixing school lunch, home lunch and dinner, not to mention express a bottle of milk for Jaguar for while I'm at my class tonight, and there is not a lot of time to blog. Not a lot of time for photos either. I wasn't ready this morning by the time Scott left for work, so I had my lovely friend Maria take a photo of me this afternoon in her garden. The 'posed' shots were rather unflattering, so I opted for this accidental one which somehow is much more flattering. 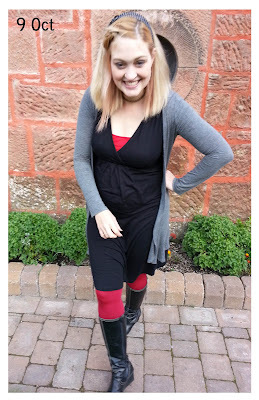 So today I'm wearing the dress with a red tank underneath, red tights, black wedge boots and a long grey cardigan. I've left my hair down (with my bad fringe pinned back) and a black headband. Now I've got to rush to put the kids in bed and then run off to my Gaelic class. Oidhche mhath!